Here are a few questions, which I loved, that are sure to spark your curiosity and imagination. 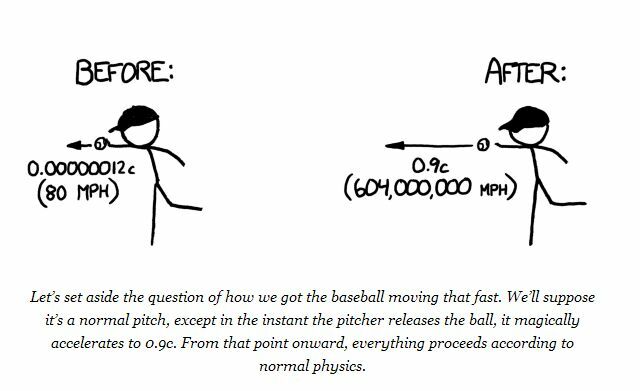 What would happen if you tried to hit a baseball pitched at 90 percent the speed of light? The answer turns out to be “a lot of things ,” and they all happen very quickly, and it doesn’t end well for the batter (or the pitcher). I sat down with some physics books, a Nolan Ryan action figure, and a bunch of videotapes of nuclear tests and tried to sort it all out. What follows is my best guess at a nanosecond-by-nanosecond portrait. The ball would be going so fast that everything else would be practically stationary. Even the molecules in the air would stand still. Air molecules would vibrate back and forth at a few hundred miles per hour, but the ball would be moving through them at 600 million miles per hour. This means that as far as the ball is concerned, they would just be hanging there, frozen. The ideas of aerodynamics wouldn’t apply here. Normally, air would flow around anything moving through it. But the air molecules in front of this ball wouldn’t have time to be jostled out of the way. The ball would smack into them so hard that the atoms in the air molecules would actually fuse with the atoms in the ball’s surface. Each collision would release a burst of gamma rays and scattered particles. These gamma rays and debris would expand outward in a bubble centered on the pitcher’s mound. They would start to tear apart the molecules in the air, ripping the electrons from the nuclei and turning the air in the stadium into an expanding bubble of incandescent plasma. The wall of this bubble would approach the batter at about the speed of light— only slightly ahead of the ball itself. The constant fusion at the front of the ball would push back on it, slowing it down, as if the ball were a rocket flying tail-first while firing its engines. Unfortunately, the ball would be going so fast that even the tremendous force from this ongoing thermonuclear explosion would barely slow it down at all. It would, however, start to eat away at the surface, blasting tiny fragments of the ball in all directions. These fragments would be going so fast that when they hit air molecules, they would trigger two or three more rounds of fusion. After about 70 nanoseconds the ball would arrive at home plate. The batter wouldn’t even have seen the pitcher let go of the ball, since the light carrying that information would arrive at about the same time the ball would. 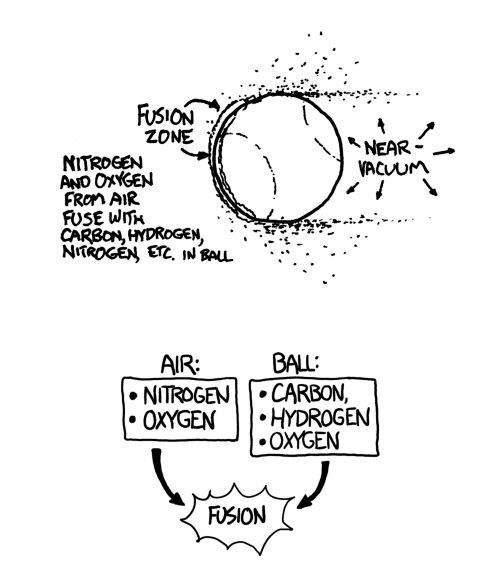 Collisions with the air would have eaten the ball away almost completely, and it would now be a bullet-shaped cloud of expanding plasma (mainly carbon, oxygen, hydrogen, and nitrogen) ramming into the air and triggering more fusion as it went. The shell of x-rays would hit the batter first, and a handful of nanoseconds later the debris cloud would hit. When it would reach home plate, the center of the cloud would still be moving at an appreciable fraction of the speed of light. It would hit the bat first, but then the batter, plate, and catcher would all be scooped up and carried backward through the backstop as they disintegrated. The shell of x-rays and superheated plasma would expand outward and upward, swallowing the backstop, both teams, the stands, and the surrounding neighborhood— all in the first microsecond. Suppose you’re watching from a hilltop outside the city. The first thing you would see would be a blinding light, far outshining the sun. This would gradually fade over the course of a few seconds, and a growing fireball would rise into a mushroom cloud. Then, with a great roar, the blast wave would arrive, tearing up trees and shredding houses. Everything within roughly a mile of the park would be leveled, and a firestorm would engulf the surrounding city. The baseball diamond, now a sizable crater, would be centered a few hundred feet behind the former location of the backstop. Major League Baseball Rule 6.08( b) suggests that in this situation, the batter would be considered “hit by pitch,” and would be eligible to advance to first base. This is one the most popular questions submitted through my website. It’s been examined before, including by ScienceBlogs and The Straight Dope. They cover the kinematics pretty well. However, they don’t tell the whole story. This crowd takes up an area the size of Rhode Island. But there’s no reason to use the vague phrase “an area the size of Rhode Island.” This is our scenario; we can be specific. They’re actually in Rhode Island. Technically, this delivers a lot of energy into the Earth, but it’s spread out over a large enough area that it doesn’t do much more than leave footprints in a lot of gardens. A slight pulse of pressure spreads through the North American continental crust and dissipates with little effect. The sound of all those feet hitting the ground creates a loud, drawn-out roar lasting many seconds. Seconds pass. Everyone looks around. There are a lot of uncomfortable glances. Someone coughs. A cell phone comes out of a pocket. Within seconds, the rest of the world’s five billion phones follow. All of them —even those compatible with the region’s towers— are displaying some version of “NO SIGNAL.” The cell networks have all collapsed under the unprecedented load. Outside Rhode Island, abandoned machinery begins grinding to a halt. The T. F. Green Airport in Warwick, Rhode Island, handles a few thousand passengers a day. Assuming they got things organized (including sending out scouting missions to retrieve fuel), they could run at 500 percent capacity for years without making a dent in the crowd. The addition of all the nearby airports doesn’t change the equation much. Nor does the region’s light rail system. Crowds climb on board container ships in the deep-water port of Providence, but stocking sufficient food and water for a long sea voyage proves a challenge. Some make it past New York or Boston before running out of fuel. Since the electricity is probably not on at this point, rather than find a working gas pump, it’s easier to just abandon the car and steal a new one. Who can stop you? All the cops are in Rhode Island. The edge of the crowd spreads outward into southern Massachusetts and Connecticut. Any two people who meet are unlikely to have a language in common, and almost nobody knows the area. The state becomes a chaotic patchwork of coalescing and collapsing social hierarchies. Violence is common. Everybody is hungry and thirsty. Grocery stores are emptied. Fresh water is hard to come by and there’s no efficient system for distributing it. The survivors spread out across the face of the world and struggle to build a new civilization atop the pristine ruins of the old. Our species staggers on, but our population has been greatly reduced. Earth’s orbit is completely unaffected— it spins along exactly as it did before our species-wide jump. What If? 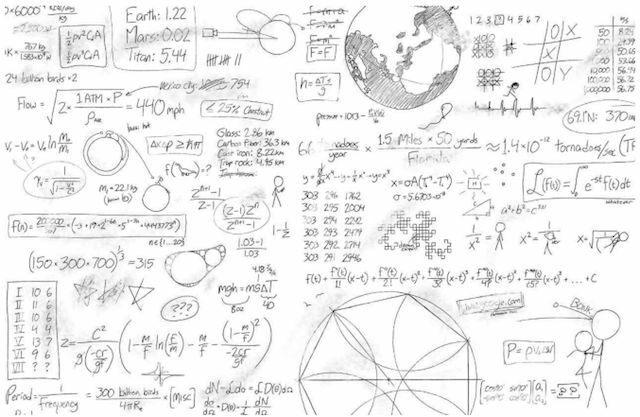 : Serious Scientific Answers to Absurd Hypothetical Questions is sure to spark your imagination and reignite your creativity.